The plan to withdraw high-value rupee notes in India had to be kept secret, Prime Minister Narendra Modi has said. Four days after the launch of the anti-corruption move, long queues continue outside ATMs as people try to exchange the 500 ($7) and 1,000 notes. "It had to be done suddenly but I never thought I will receive blessings for this," Mr Modi said. He hinted that other measures aimed at fighting corruption and the black economy might follow. Can currency ban really curb black economy? Urging people to be patient, Finance Minister Arun Jaitley said that it would take a few weeks for banks and ATMs to completely replace the old notes, estimated to make up some 85% of the total currency in circulation. Mr Jaitley said that nearly $30bn in the old notes had so far been deposited in banks across the country. 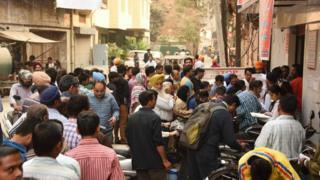 But chaotic scenes can still be witnessed outside banks as public patience is beginning to wear out, says the BBC's Sanjoy Majumder in Delhi. Some traders and small business owners have threatened to go on strike because they have been badly affected, our correspondent says. The opposition has also been critical of the move, saying the rural and urban poor have been hit hardest. But Mr Modi thanked his fellow countrymen who had "accepted the decision in national interest". And he warned that there was "no guarantee" that new measures would not follow after the note-exchange scheme ends on 30 December. He said "no-one would be spared" in the drive against corruption. But "honest people will not face any problem", he added. After Mr Modi's surprise announcement on Tuesday night, the banks were closed on Wednesday. Thousands of panicked Indians have been flocking to banks since they reopened on Thursday. There are limits on cash withdrawals from ATMs and banks. How long have people got to change their old notes? The 500 ($7; £6) and 1,000 ($15; £12) rupee notes are the highest denomination notes in the country and are extremely common in India. Airports, railway stations, hospitals and fuel stations will only accept them until the end of today. People will be able to exchange their money at banks between 10 November and 30 December. How much 'black money' is there in circulation? The actual figure is unclear but correspondents say the issue of "black money" - which may have been acquired corruptly, or is being withheld from the tax authorities - is a huge problem. India's government hopes to flush out tax evaders and make money that is unaccounted for visible for tax purposes. There have been reports of tax raids in many parts of India. Is there a limit on the amount an individual or household can cash in? An individual can put as much as he or she likes into the bank - but withdrawals are limited so the banking system may end up being flooded with cash. Government guidelines say it is possible to exchange up to 4,000 rupees per day up to 24 November - anything over this will be subject to tax laws. People can also withdraw up to 10,000 rupees from a bank per day and a maximum of 20,000 rupees per week. Are the new notes safer? New 2,000 and 500 rupee denomination notes with new security features are being given to people to replace those removed from circulation. A new 1,000 rupee note "with a new dimension and design" will also be introduced in due course, a senior government official said on Thursday. What will foreign tourists carrying the banknotes do? They can purchase foreign exchange equivalent to 5,000 rupees using these bank notes at airport exchange counters until midnight on Friday.